I originally wrote the following as a post for the Sea-Fever blog in 2007 and thought I’d repost here today in honor and celebration of Martin Luther King Jr. Day. It also seemed appropriate on the eve of the Inauguration of our nation’s first black President. Yesterday was Martin Luther King Jr. Day and in recognition of the holiday last night I reread his Letter from a Birmingham Jail (April 16, 1963). I am sure that I must have read it previously in high school or college but I more recently became re-acquainted with it when I participated in Aspen Institute’s Executive Seminar in May 2006. If you have not read it or need a refresher like me, you can find online and downloadable versions here. I believe that King’s letter is an amazing work for many reasons with one of the most important being that it effectively frames the difficult conversation. This is no small feat. Sitting in a jail cell presents a limited range of options for leadership but King quickly responds to the opportunity created by the Alabama clergymen’s public statement (April 12, 1963) directed at him regarding the nonviolent demonstrations taking place in their community. It is a very powerful piece of writing and worth the time it takes to read closely. When I think of Martin Luther King Jr., I immediately think of the words vision, mission and values. To me King clearly demonstrates the power and importance in connecting these three concepts in order to accomplish what he set out to do. As a leader, King takes advantage of opportunities to communicate his vision, mission and values to wide audiences. His letter from a Birmingham jail may have been written to the Alabama clergymen, but his intended audience was anyone who was concerned about racial injustice in Alabama and across the nation. To me the jumping off point for all of this in the need to identify the core values that will guide the creation of a vision and the setting of a mission for an organization or cause. 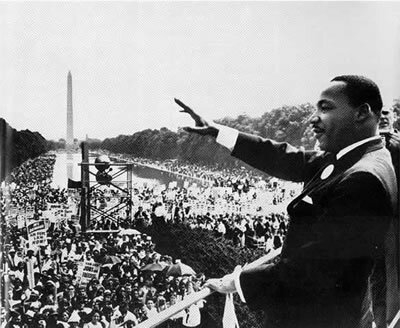 Finally, it had been a while since I watched Dr. King’s “I have a dream” speech (August 28, 1963). Like reading Letter from a Birmingham Jail, I believe it is worth taking the time to watch this video. Posted in Diversity, General Leadership, Opinion. Tagged with Martin Luther King Jr., mission, values, vision.